[post_content] => New pork and beef meat pockets hide rich and juicy content with cream cheese and beetroot filling. Meat pockets are cooked golden brown in vegetable oil and need only heating. Enjoy with mashed potatoes, fresh salad or any other enjoyable side dish! [post_content] => New pork and beef meat pockets hide rich and juicy content with cream cheese and caramelized onions filling. Meat pockets are cooked golden brown in vegetable oil and need only heating. Enjoy with mashed potatoes, fresh salad or any other enjoyable side dish! [post_content] => Real legend and Rakvere classic. Cutlets that have been loved by Estonians for more than 20 years. Cutlets with classical homely seasoning  are made of pork and beef (meat content 67%) and cooked golden brown in vegetable oil. There are no added preservatives nor artificial flavor and smell enhancer E621. 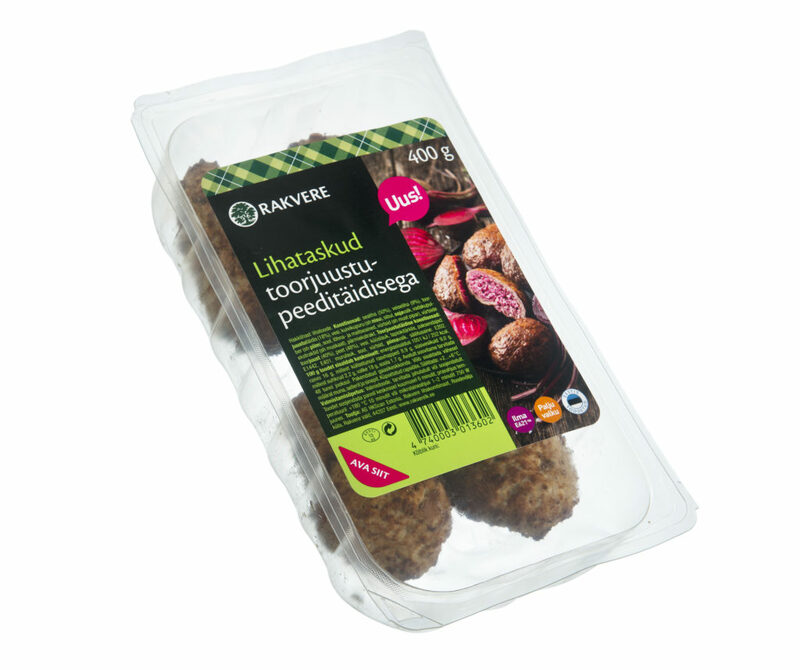 Rakvere cutlets are suitable for eating straight from the package, on sandwich or as a part of dish when heated. Rakvere cutlets are also super comfortable, fast and delicious solution between homely burgers. New pork and beef meat pockets hide rich and juicy content with cream cheese and beetroot filling. Meat pockets are cooked golden brown in vegetable oil and need only heating. Enjoy with mashed potatoes, fresh salad or any other enjoyable side dish! Pork (50%), beef (9%), cream cheese filling (18%), water, rusk (incl wheat), onion, soy protein, whey protein (incl milk), salt, flavorings, spices (incl black pepper), spice extracts (incl nutmeg), yeast extract. Cream cheese filling´s ingredients: cream cheese (40%), beetroot (48%), water, garlic, tapioca starch, thickeners: E1442, E401, chive, salt, spices, milk protein, preservative: E202. Ready to eat product- consume heated or chilled. Remove the package and cook the product on a skillet at medium high heat for 6 minutes, in the oven at 180 degrees for 10 minutes or in microwave oven at 750W for 1-2 minutes.